MCG Product Preview – Summer 2016, Focus on the upcoming Gods of the Fall with an excerpt of fiction by Bruce R. Cordell and our review of the new Divine Dominion mechanic. The latest Streets of Qi, by Chris Fitzgerald, looks at Miranda’s House, a boarding house in Qi full of interesting NPCs. 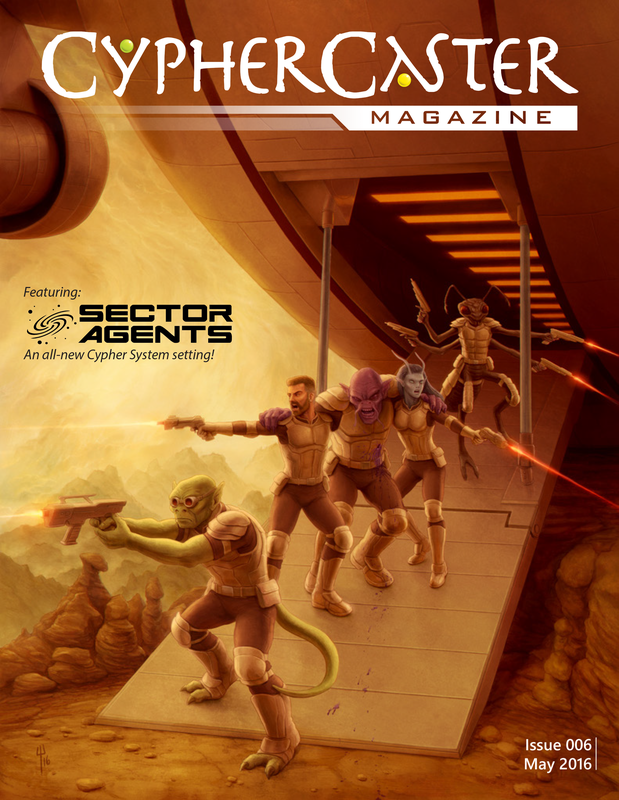 Sector Agents, a pulpy space setting featuring law agents of the Galactic Union. Many contributors present this twenty page section with setting information, alien species, a location, and two complete missions! Hacking the Cypher System: Vehicles with Character by Marc Plourde. An article how to build ships that reflect the type of character building that the Cypher System usually reserves for player characters. (A great companion piece to the Sector Agents material). Field Mission, a short Strange fiction by Andrew Cady about the Estate seeking to stop a cult from opening a dangerous portal. Across the Seas of Zuòmèng: To Climates Unknown, part 2 of our Zuòmèng Strange recursion. This part is a full adventure set in the world of Zuòmèng, by Rustin Coones, Scott Robinson, & Jennifer Ross. The action-packed painted cover art by Yannick Bouchard ties into the fiction that starts the extended feature, Sector Agents.